Dr. Lon Grassman, with the Caesar Kleberg Wildlife Research Institute at Texas A&M University, Kingsville, conducted a field study of the ecology of several rare and endangered carnivores in Phu Khieo Wildlife Sanctuary (PKWS), Thailand. This long-term study began in November of 1998 and ended in 2002. Lon’s study consisted of camera trapping, live trapping, radio collaring and tracking several previously unstudied carnivores, including clouded leopards. 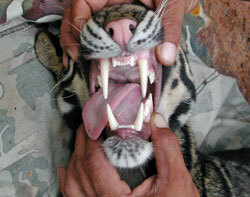 His results indicate that PKWS may contain the largest population of clouded leopards in Thailand. The low densities of tiger and leopard combined with healthy primate and ungulate populations are likely contributors to this situation. 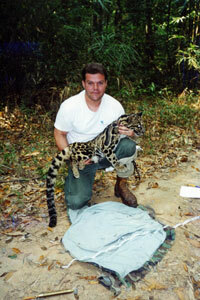 Lon successfully radio collared and released two females and two male clouded leopards. By monitoring their activities, Lon obtained some of the first data ever compiled on the behavior of wild clouded leopards. The results of his study will help the government of Thailand develop and implement conservation strategies. Supporters of the Clouded Leopard Project helped provide Lon with the day to day expenses of conducting field research including the purchase of food, batteries, gasoline, camera traps and chickens (bait for traps), film developing, and salary for a field assistant. The results of this study were published in Journal of Mammalogy, 86(1): 29-38, 2005. After the completion of his carnivore survey in 2002, Lon Grassman has partnered with Jan Janecka, also of the Caesar Kleberg Wildlife Research Institute, Texas A&M-Kingsville, on a new study in collaboration with Dr. Whichan Eiadthong, Department of Forest Biology, Kasetsart University, Thailand. This study will use molecular genetics to enhance the conservation and captive breeding of clouded leopards and other wild cats in Thailand. The application of genetics to conservation provides critical insight into the history, current status, and future conservation of threatened populations. Currently, no information exists on the population genetics of the clouded leopard, Asiatic golden cat, marbled cat, and leopard cat. Because Lon was able to obtain samples of genetic material from these species through the collection of blood and hair samples in his previous study, the team now has the opportunity to analyze these samples and estimate a number of genetic parameters. They will also examine other samples obtained from these species in previous studies. In addition, they hope to partner with the Zoological Parks Organization of Thailand to evaluate samples from cats living in captivity in Thailand's Khao Kheow Open Zoo. 1. To examine the genetic erosion that may have occurred in wild and captive clouded leopard and leopard cat due to fragmentation and reductions in population size. 2. To provide baseline data on genetic variation of clouded leopard, Asiatic golden cat, marbled cat, and leopard cat in wild and captive populations in Thailand. 3. To provide genetic information on captive populations that will be pertinent to breeding and zoo exchange strategies. 4. To estimate the level of gene flow between Phu Khieo Wildlife Sanctuary and Khao Yai National Park. 5. To estimate the long-term effective population size and recent reductions/expansions of leopard cats. 6. To support and expand a wildlife genetics laboratory at Kasetsart University in Bangkok, Thailand. The data obtained through this study will have a wide variety of applications in the development of conservation plans for these species. Because the distribution, status, and population history of wild cats in Thailand is largely unknown, genetics can provide information on population parameters critical for conservation and recovery plans that will ensure long-term survival of threatened wild cat populations. There is strong evidence that genetic variation is an important determinate of population viability and adaptability and may be a limiting factor in the recovery of some populations. In addition, genetics research can provide zoos with information on the relatedness and coancestry of the population that is essential to minimizing inbreeding and maximizing genetic variation in breeding programs. Genetic analysis may also provide information on the origin or source populations of captive individuals and the level of genetic variation that has been preserved in captivity. The Clouded Leopard Project is proud to support this important research effort.